A Chinatown civic and business group and Community Board 3 both got some first aid last Thursday. Each group has been awarded a Sept. 11 Recovery Grant by the American Red Cross Liberty Disaster Relief Fund to help improve the community. The grants are part of a Red Cross program to help neighborhoods recover from the lingering effects of the 2001 terrorist attacks. The Chinatown Partnership Local Development Corporation was awarded a 422,000 grant, while C.B. 3 received 100,000. The Chinatown Partnership will use its grant to create a public process to assure that the community is actively involved in the planning and redesign of parks and streets in Chinatown. C.B. 3 will use its grant money on a Lower East Side Transportation Awareness and Outreach Program that will focus on issues like Park Row, which is still partially closed four years after 9/11. The announcement was made at a press conference in Chatham Square attended by Amy Chin, interim executive director of the Chinatown Partnership L.D.C. ; David McWater, chairperson of Community Board 3; Peter H. Kostmayer, president of Citizens for NYC; Danny Chen, project manager of the Community Board 3 Transportation Project, and other community leaders and residents. "With more than half of the residents of Lower Manhattan living in Chinatown, post-9/11 community revitalization efforts cannot ignore the plight of this historically significant community," said David Louie, Chinatown Partnership L.D.C. chairperson. "Now, thanks to this Sept. 11 Recovery Grant from the American Red Cross and extraordinary collaboration with our partners - Community Board 3, Civic Center Residents Coalition and Citizens for NYC - this community will receive the attention it deserves and the help it so desperately needs." After the 9/11 attacks, major-access arteries like Park Row in and around the vicinity of Chinatown were closed, as were the side streets that connected the neighborhood to other parts of Lower Manhattan. Today, due to the continued closing of Park Row for security reasons, access to much of Downtown, including City Hall, the courts, government offices and NYU Downtown Hospital, remains more difficult than it was before the terrorist attacks. Amy Chin, Partnership interim director, said the projects' planners must seek and engage the Chinatown community. 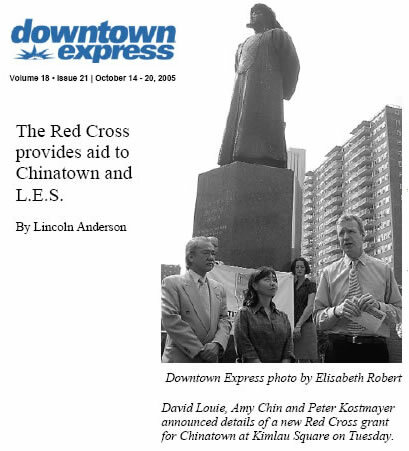 With the Red Cross Sept. 11 Recovery Grant, the Chinatown Partnership L.D.C. will create a comprehensive public process to engage the community in the future design and development of its neighborhood through open forums, community outreach, street-level discourse and workshops. Chin noted, "By encouraging Chinatown residents to become involved and by soliciting their ideas and views, we will create culturally appropriate designs that reflect local needs and uses. And more importantly, residents will begin to reclaim ownership of their community, much of which had been usurped because of post-9/11 security concerns." The Partnership will focus on four key projects: traffic improvements at Park Row, and new public space designs at Chatham Square, Pier 35 and James Madison Park. The Partnership will also use the Red Cross funding to create a Chinatown Night Market, modeled on a tradition of night markets in East Asia and the new, successful night market in San Francisco - as well as outdoor events that combine family time with community interaction. Additionally, the Partnership will create a semi-volunteer team of trained bilingual community information guides, called Jammers, standing for "Just Ask Me." Jammers, identifiable by their colorful uniforms, will provide residents and visitors vital information about access to public and private services, cultural institutions, city and state agencies, local businesses, social service programs, educational institutions and other services. Jammers will receive a modest stipend. C.B. 3 will use its grant to put do a monthly newsletter, Web site and four public forums on transportation issues and to fund student interns working on traffic-simulation programs.